Sono un appassionato collezionista, ma dipingo anche su commissione singoli modelli, in particolar modo eroi, campioni e stendardieri. Effettuo eventualmente anche piccoli lavori di conversione. Non dipingo armate. Se interessati, potete contattarmi all'indirizzo di posta elettronica info@oryctes.com. 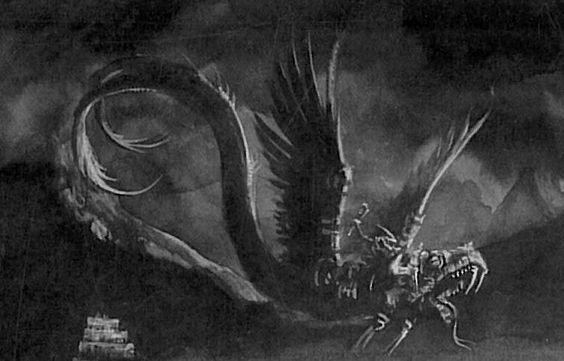 Come appassionato di modellismo, sono molto affascinato dai mondi fantastici in cui sono ambientati i giochi di ruolo da tavolo di Warhammer Fantasy Battle e Warhammer 40K, entrambi della Games Workshop. 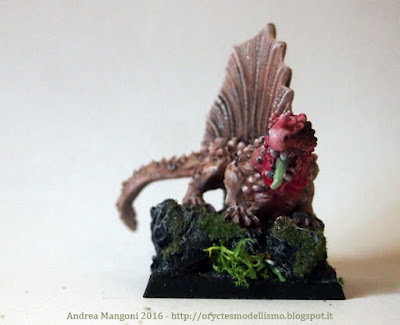 Non sono un giocatore, ma un collezionista di vecchie miniature citadel ed un appassionato di conversioni. 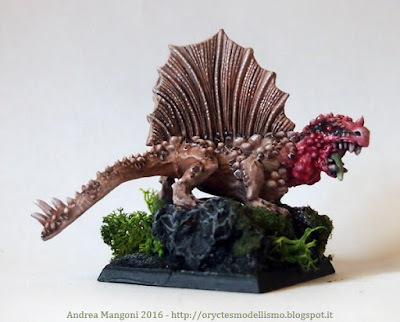 Tra i miei interessi vi sono i range di miniature di Lizardmen, Chaos (sia WFB che W40k), Undead, draghi e altre miniature. Oryctes.com nasce alcuni anni fa come sito personale dedicato all'allevamento degli animali e della natura. Negli anni è creciuto, si è ampliato, ed è venuto a toccare molti argomenti differenti. 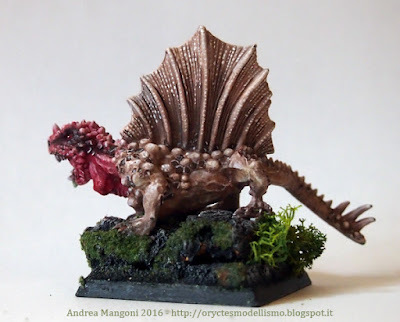 Desideroso di poter parlare della mie altre passioni, ho deciso di affiancare al sito statico anche diversi blog, che trattano argomenti legati tanto alla natura quanto agli altri miei interessi. Tutte le foto ed i testi presenti, così come i lavori di pittura e conversione (salvo altrimenti specificato), sono di Andrea Mangoni. Tutti i diritti riservati. Qualora necessitaste di utilizzare parte del materiale contenuto in questo blog, contattatemi pure all'indirizzo info@oryctes.com. Il template di questo blog è stato ottenuto utilizzando insieme alcune immagini riprese dal template "Hobbit" della Arcsin ed il template Scribe di Todd Dominey . This model is an old citadel Kroxigor from 5th edition Lizardmen army. It's probably my favourite ever Kroxigor model. I've done a little conversion, adding a crest from an old chaos hound model, and an horn from a plastid dwarf warrior. 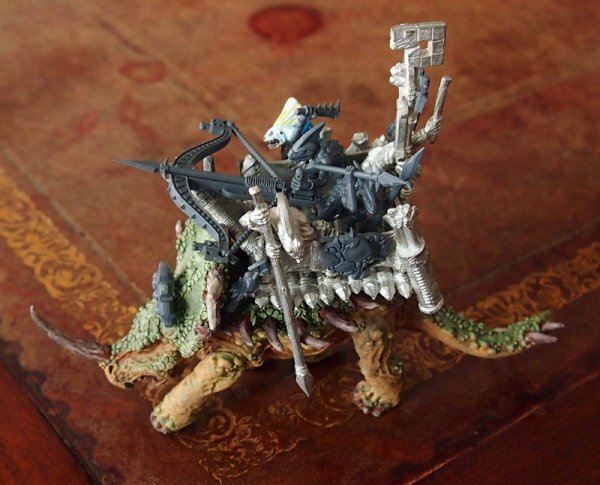 This Kroxigor will be added to a skink unit, that I'll paint in future. Ciao! 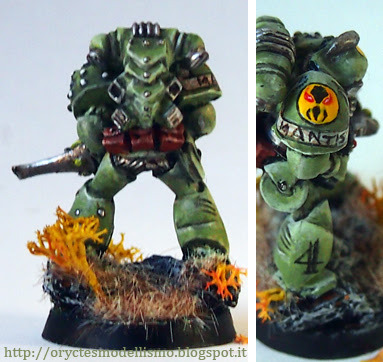 1988 Citadel Mantis Warriors Space Marines with shuriken catapult. I needed a break from my current involvement with the SouthLand Lizardmen Army project, so I decided to paint something different. 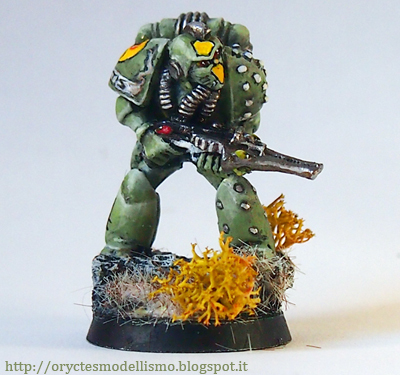 The model is a Space Marines from 1988 Citadel Catalogue armed with a shuriken catapult. 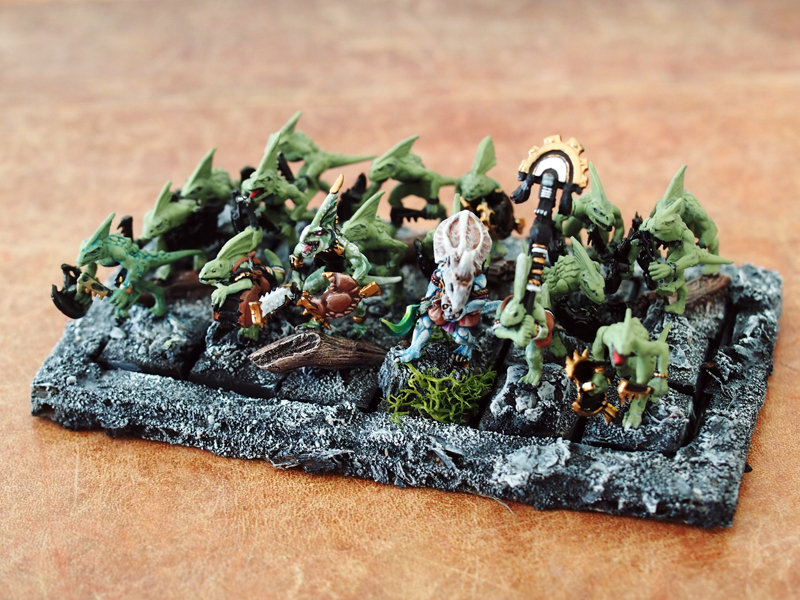 I chose the chapter of the Warriors Mantis, using the color scheme present in older White Dwarf numbers. It will be the first of a series of models of the Rogue Trader Era that I paint from time to time in the coming weeks. Citadel 5° Edition stegadon WIP. 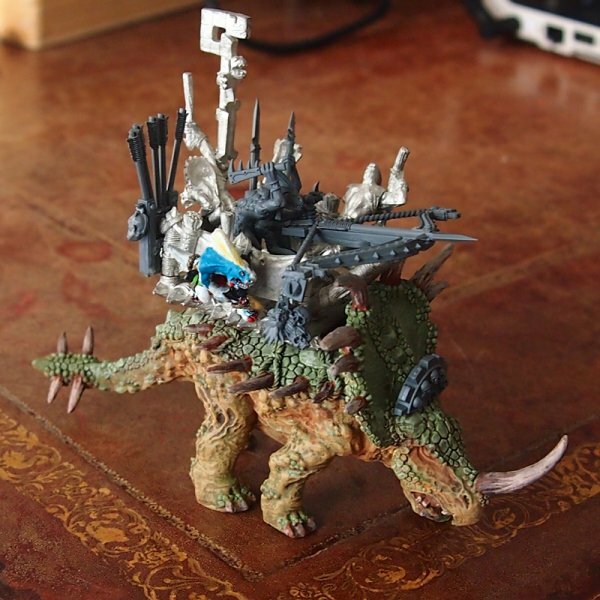 After I start working on the new stegadon, I decided to resurrect my old 5th edition metal model. So I made some conversions to make it in line with the new plastic stegadon, using part of bits from the latter. The howda is the original one, while the crew is in part made from new plastic models, as well as the giant bow. I hope to soon dedicate to finish both of these monsters. Ciao! 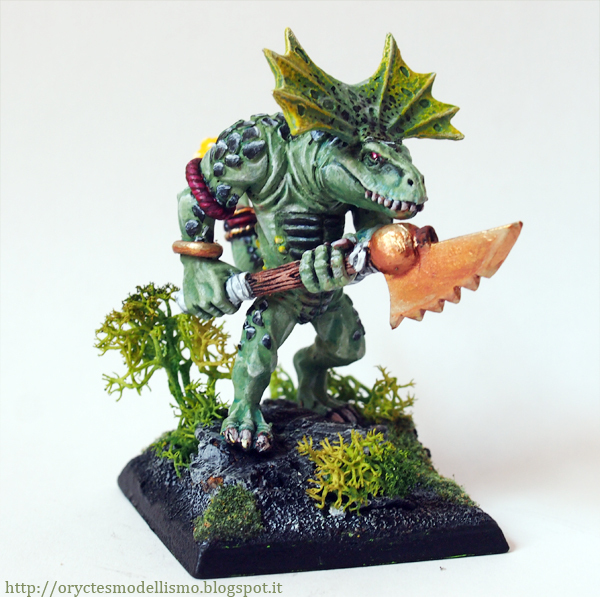 Citadel - 5° edition Lizardmen Salamander. Some days ago I had few hours available to paint, and I've chosen this miniatures, a 5° edition Lizardmen salamander, for a complete restyling. I've tried many times to paint her, but I was never satisfied by the results, 'cause I wasn't happy of the colour scheme. This time I think that I've found what I was searching for: a colour scheme inspired by a real lizard genus, the Calotes, with many nuances of brown and a reddish head. Soon I'll paint also her handlers. WIP Ancient Stegadon - The crew. The crew - click to enlarge. I've recentely received the beautiful stegadon kit, and I've choosed to utilize the main model to build an ancient stegadon, while some pieces will be utilized for a more interesting conversion. 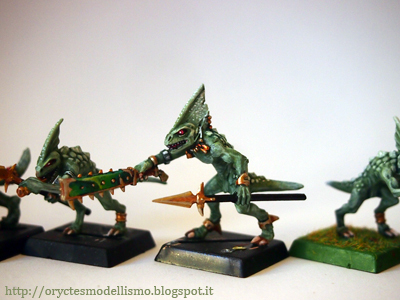 I've just finished to paint the howda crew: 5 skinks, choosed from a wide range of models. 2 of them come from the stegadon kit, a plastic archer and a metal standard bearer from 5° edition are been converted and joined to the team. 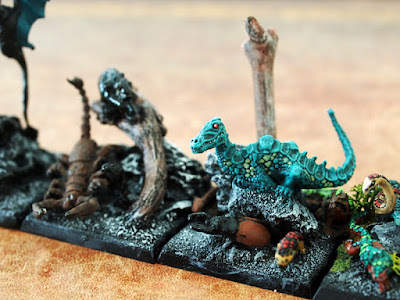 5° edition skinks converted for the crew. 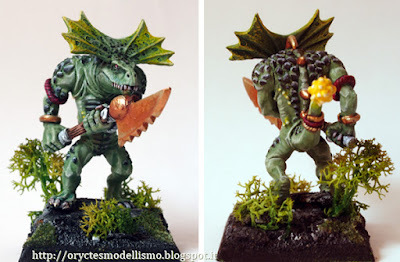 A 7° edition skink champion is now the leader of the group - also this model is a conversion, with an head swap. 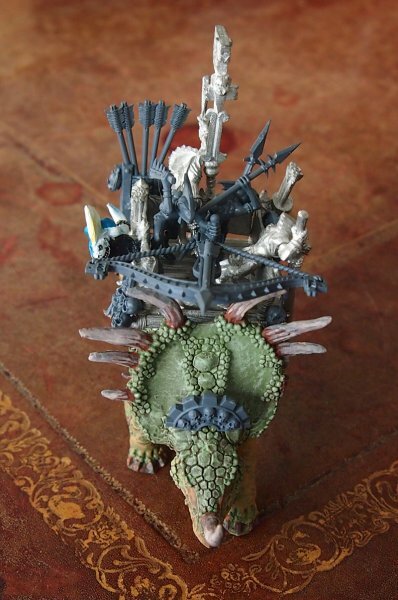 Now I will work on the stegadon himself, and on the howda. Hope to finish this beauty soon. ciao! I've just found this beauty in a drawer: a beautuful Orc War Wivern from Citadel catalogue, august 1987. More Lizardmen WIP - Skinks and jungle swarms (more oldhammer here). 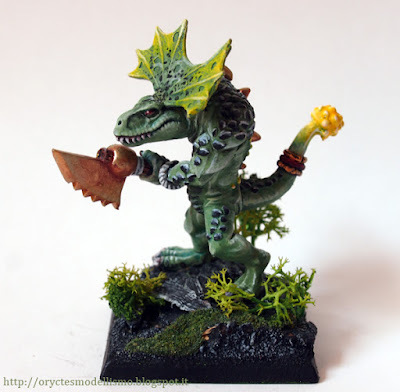 Young forest dragon and other oddities in my jungle swarms! Click to enlarge. I'm always working on my Lizardmen. 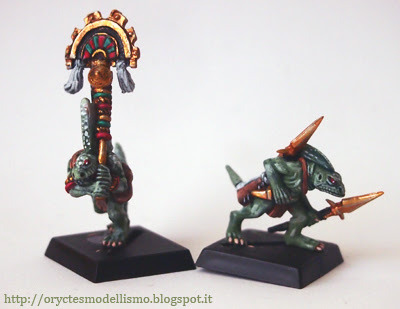 More work on Skinks unit - I've add another rank, so now they're 18 models total. They're almost all new skink models, with some conversions and 2 models from 5° edition. All models has been based, they've all received first layers of colours on skin, the champion has a more complete painting scheme. 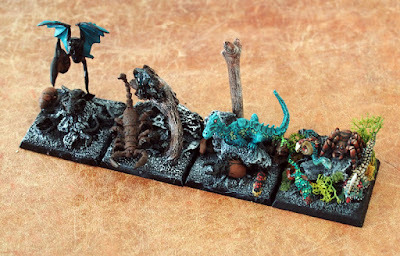 First Skinks unit - Click to enlarge. I've also started to work on Jungle swarms. I've utilized a whole range of model for my swarms - "classic" lizards, snakes and plastic spiders models but also very little and interesting citadel oddities like Citadel C29 Creepy Crawlies (Tick 2, Beetle 2), Citadel FF50 giant scorpion body (with a tail from a plastic miniature set) and Citadel DS5 young forest (this one, without wings, it's now a great giant lizard). 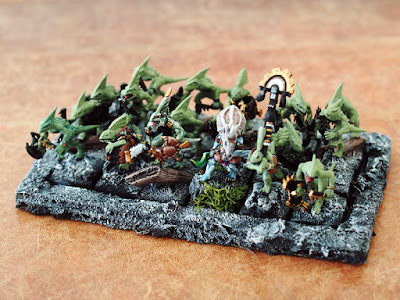 Alternative models for my jungle swarms! Click to enlarge.